When travelling to Vietnam, I visited one of the fish markets on the water in the Mekong Delta. The Mekong Delta is a village in Vietnam that is considered a floating village as all the markets are on boats and the Vietnamese people work and spend their days on the boats to sell their vegetables, fish, or other products to customers. I was startled by this as I thought there would be schools close by for children to go to and that got me thinking. I believe there should be a “floating school” started in order for students to receive the education they deserve but also help their parents and their business if need be. This floating school would be on the waters in the same areas as the market so that it would be close to their homes and not out of the way. The floating schools would hopefully help the students with education opportunities and provide a foundation for their future to either continue their parents business or have the opportunity to start something new. Every child deserves the ability to receive a proper education. 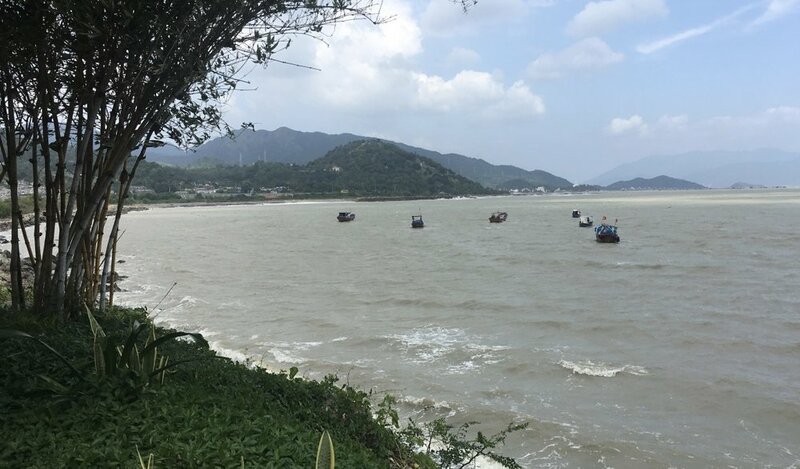 The first picture shows some of the boats that are considered the floating markets where the Vietnamese people sell their fruits, vegetables, fish, etc. The second picture shows the dock down to the boats and the transportation around it. 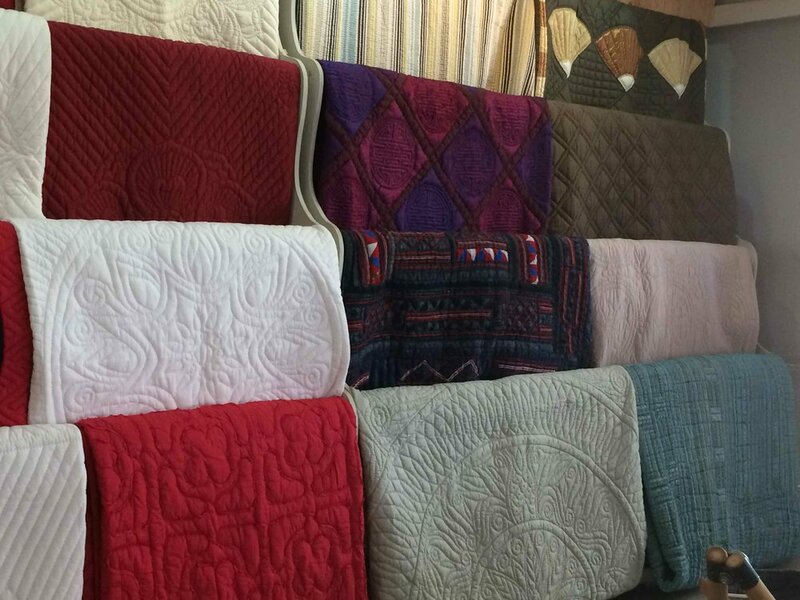 During my travels in Vietnam, I stumbled upon a local craft shop called Mekong Quilts and Mekong Creations. The small store was filled with handmade products that showed detailed handiworks, exquisite designs, and vivid colors. 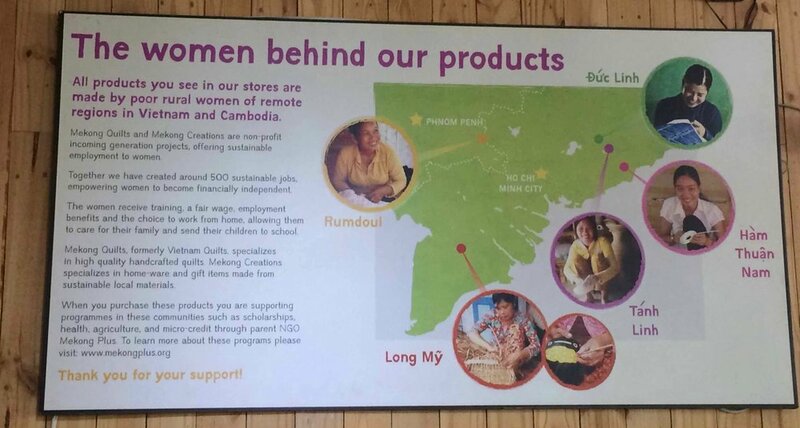 All of the goods sold in the store were handmade by women in rural Vietnam and Cambodia. This store is a part of a large network called Mekong Plus. Mekong Quilts and Mekong Creations is a non-profit organization that focuses on employing and educating women. These women are able to become financially independent and can provide for their families. By selling their products through this service, the women have the option of working in or out of the home. They are able to choose based on their needs and family circumstances. All of the profits made are used to support this initiative. Additionally, Mekong Plus awards scholarships, micro-loans, and supports health and agriculture programs. This program has provided over 500 jobs to impoverished women. I am grateful that I had the opportunity to find this shop. Its mission and the methods of empowering women in rural Vietnam and Cambodia are truly inspiring. Fifth Ave or Caribbean Island? You tell me…. Welcome to Fifth Avenue NYC I thought to myself driving through the city streets in Ho Chi Minh City! Meanwhile, disembarking the ship in Vietnam felt like stepping off the plane on a tropical island. I pictured myself strolling down the beach buying hand-embroidered dolls and keychains in St. Lucia as I walked through the market set up near port. Contrarily, our drive to the airport brought me to 5th Avenue in NYC with its fancy designer stores, modern buildings, and luxury American brand hotels. As seen, Vietnam is in a state of transition with a lot of room for social ventures to bridge the gap between socio-economic classes. 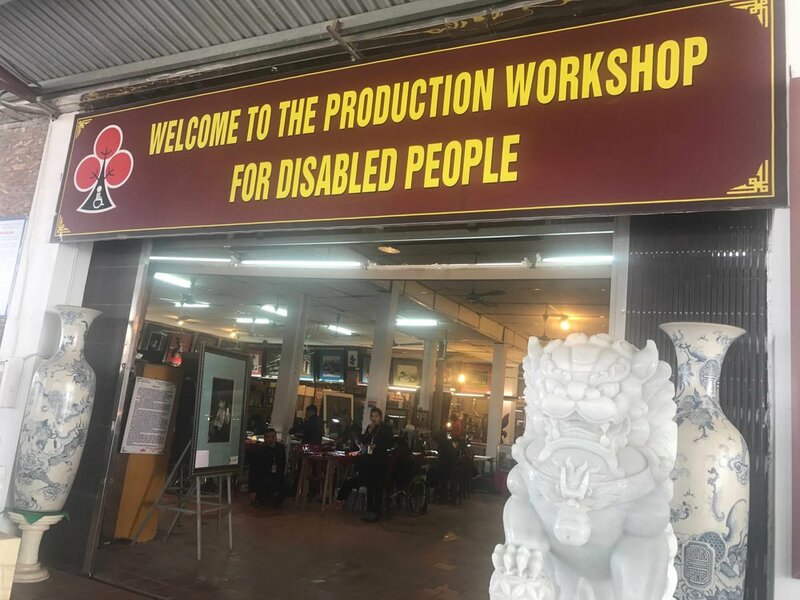 The Production Workshop for Disabled People is a large retail store setup in a warehouse-like structure, surrounded by an outdoor sculpture garden, along the route to HaLong Bay. It aims to bridge the socio-economic gap that plagues Vietnam by offering the unlucky disabled population work they can handle. Because of the Vietnam War and Agent Orange, the country has a proportionately large disabled population relative to other developing nations. The Production Workshop recognizes that despite these people’s partial disabilities, they can sit up and perform unique work, such as painting, embroidering, sewing, making toys, and designing souvenirs. In response, the management team provides a workshop and leadership team to house the facilities and run a self-sufficient operation, effectively. To further contribute, management looks after the sales stats to help maintain high margins. Opening the facilities to tourists has likewise augmented its success by increasing shopping traffic and revenues. Proportionately high disabled populations tend to have high unemployment rates and high demand for government aid as disabled people struggle to find job openings they are capable of fulfilling. 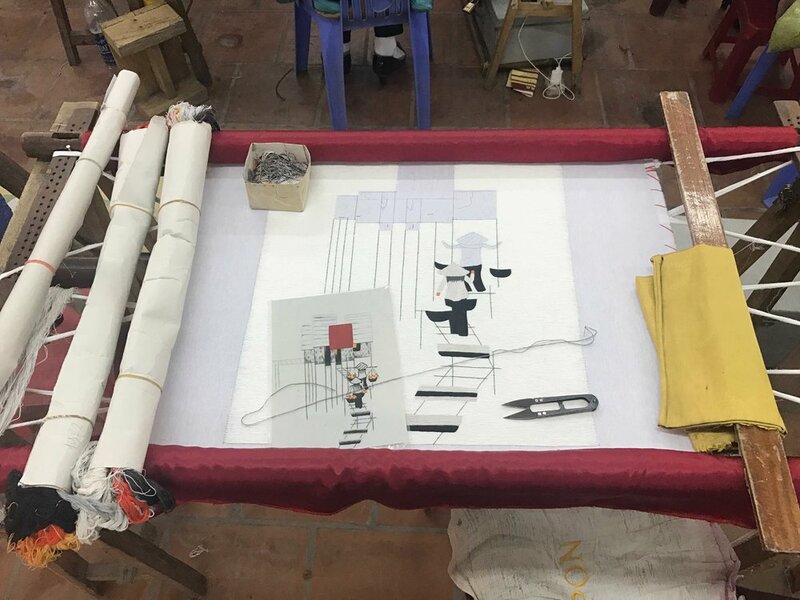 To mitigate these effects, the Production Workshop for Disabled People employs nearly 80% of their sales people and 100% of their crafts people from the disabled subset of the Vietnamese population. In doing so, the venture helps keep individuals out of poverty, while simultaneously stimulating the economy. Moreover, tourists have taken an extreme liking towards the facility, often using it as a rest stop and shopping spree on their way to HaLong Bay, one of the largest tourist attractions in Vietnam. There’s nothing better than a great meal. One of the highlights of traveling to so many countries has been being able to sample the local cuisines and actually tasting the differences that make each culture unique. 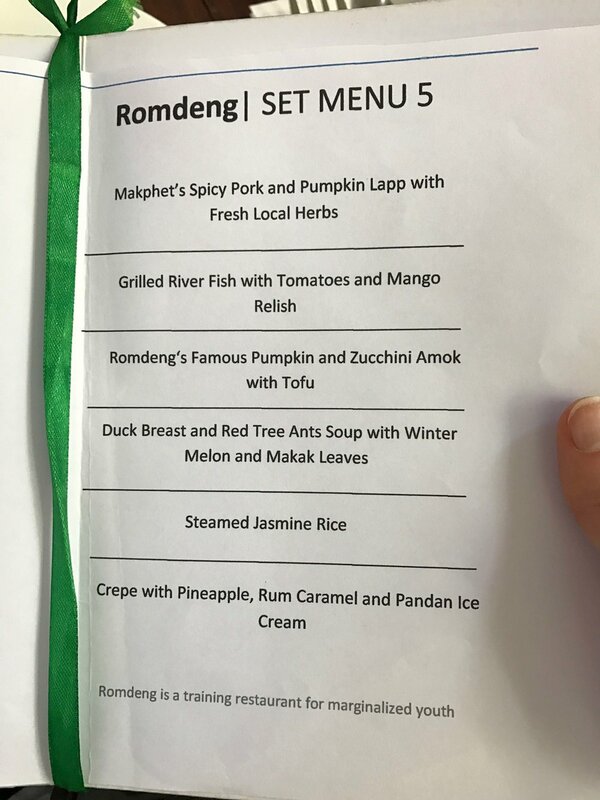 During my time in Phnom Penh, Cambodia, I was lucky enough to enjoy lunch a Romdeng, a local restaurant that serves up Cambodian fare with a philanthropic twist—they’re a training restaurant for marginalized youth. Romdeng is one of 2 restaurants in Cambodia founded by TREE, a global alliance of training restaurants that provide at-risk children and young adults, often taken off of the streets, with on-the-job training in the hospitality industry. Students work in the kitchen and serve customers, practicing their English, learning skills like communication and teamwork, and receiving a valuable support system that gives them the confidence and empowerment to pursue further employment. All of the profits from the restaurants are re-invested in the students and the social programs that support them. TREE has restaurants throughout the world in places like Laos (Vientiane and Luang Prabang), Thailand (Bangkok), and Ethiopia (Addis Ababa). Romdeng is run by Mith Samlanh, a local NGO founded in 1994 that specializes in enriching the lives of local children (from infants up to age 24) in Phnom Penh through things like art, sports, and culture. Not only did I feel like my patronage was making a positive impact on the community, but the food and atmosphere was fabulous as well! All of the restaurant’s bright, tropical decor is made by local Cambodian artisans and all of the seat cushions and wall art were crafted by the children at Mith Samlanh. The restaurant is open air and has a pool in the center of it, so we got to enjoy the fresh breeze and warm air while we ate. The highlights of the meal for me was a flavorful pumpkin and zucchini curry that was served in a banana leaf bowl. We also were served a lemongrass soup with duck and tree ants (!!!) which was surprisingly tasty, you would’ve never thought you were eating insects! The table next to us ordered a plate of tarantulas, which I enjoyed taking pictures of but left the eating to them! What’s the best (or strangest!) meal you’ve had while traveling?